MyLab™ Math is an online homework, tutorial, and assessment program designed to work with this text to engage students and improve results. Within its structured environment, students practice what they learn, test their understanding, and pursue a personalized study plan that helps them absorb course material and understand difficult concepts. The 6th Edition of College Algebra with Modeling & Visualization continues to expand the comprehensive auto-graded exercise options. The pre-existing exercises were carefully reviewed, vetted, and improved using aggregated student usage and performance data over time. In addition, MyLab Math includes new options to support conceptual learning, visualization, and student preparedness. NOTE: This package includes a MyLab Math access kit created specifically for Rockswold, College Algebra with Modeling & Visualization 6/e. 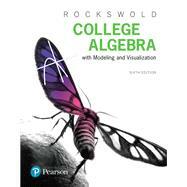 This title-specific access kit provides access to the Rockswold, College Algebra with Modeling & Visualization 6/e accompanying MyLab course ONLY.